Sun and clouds mixed. High near 55F. Winds W at 10 to 20 mph.. In a prime room with a view on the second floor of Missoula's new Partnership Health Center, a brand-new $70,000 dental clinic overlooks the city's old, leafy trees of its North Side neighborhood and the hills beyond. Yet, on one midafternoon weekday last week, the lights were out. The clinic's chairs are only occupied about 30 percent of the time. Meanwhile, its waiting list stands at 769 people. Each person needs an average of three-and-a-half visits. That means the list holds 2,691.5 visits. The clinic, opened in April, has 16 dentists on its volunteer list - 11 who volunteer on-site and five specialists who see patients in their own offices - as well as six hygienists and two dental assistants. It needs more, says Partnership director Karyn Collins. "We have a serious commitment to increasing dental care in our community," she said in a recent interview. "We have people living in Missoula who have incredible dental needs. They haven't been to a dentist in years. There's a terrible need." During the next two weeks, Missoula dentists will get letters and introductory packets inviting them to participate. If they're interested, a volunteer dentist will call on them to explain the program. Collins hopes to hook a few. "Once they volunteer, they do more and more," she said. "They know they're appreciated. Their time is well used. They see how much they're needed." At least 75 percent of the public clinic's medical and dental patients are underinsured or have no health insurance at all. Of the patients who made the 10,000 visits the clinic logged last year,72 percent earned wages that were 150 percent or less of the federal poverty guideline. "There are a lot of people in Missoula who are poor," Collins said. "They don't look poor, and they have jobs, but they are poor. We have a lot of patients who have two jobs." Christine Sanders and her family of five are among those families. She and her husband have three children, two boys 10 and 12 and a girl, Marlena, who's 5 and just started kindergarten at Franklin School last week. Three years ago, her husband lost his job as manager of a Jiffy Lube. It provided health insurance for the family. His new job, at another lube-and-oil shop, provides no insurance. At Christine's job in a local drug store, she could buy health insurance for her family at about $380 a month, way out of reach. The family makes too much money for Medicaid and would have to pay a $1,000 a month spend-down to qualify. Last spring, when her 10-year-old developed an abscessed tooth, she took him into the medical clinic at Partnership. They put him on the dental waiting list. When the dental clinic had a cancellation and called, "I got down here in 11 minutes," Christine said. One day last week, an appointment came up for Marlena. She had a check-up with volunteer dentist Ralph MacDonald. He found Marlena had cavities, and dental clinic coordinator Joan Beebe scheduled Marlena for more appointments. "We wouldn't have access to this kind of care at all," she said in an interview. "No way. For us, it's just really important to get the kids done. Otherwise, they wouldn't have any care at all." MacDonald, who retired three years ago after 34 years in his Missoula dental practice, volunteers a half-day a week. "I just feel very strongly that this is a necessary thing," he said. "There's so many families in Missoula that are below the poverty level. The little bit I do just doing exams hopefully helps." Beebe prioritizes the waiting list by putting children in pain at the top. Then come children with no pain, then adults in pain, and last adults without pain. She knows the most common problems from answering the phone. "Toothaches," said Beebe. "They call about toothaches. Children with toothaches, particularly." Beyond that, she said, "It could be numerous things. It could be an abscess with swelling. It could be deep decay to the nerve. We see it all." Beebe came to the clinic from a private dental office. t they're lots more," she said. "And they're more profound. In a private practice, where people are seen regularly, they don't get so bad." "There are no dentists taking new Medicaid patients," she said. "People are coming in with massive decay because it hasn't been caught. And there's a lack of education because they haven't been to the dentist." Missoula dentist Jackie Jones volunteers one morning a month, seeing mostly children. "I see a real range of problems," she said. "Some of the kids I see have real extensive decay and serious decay in baby teeth." Jones hopes that the continuing volunteer effort could stabilize the children who come in with serious problems. "I think it's going to take a while to get caught up with all the bad problems before we start in with more general dentistry," she said. "We're hoping that once we start talking about it and telling how it's going, we'll start getting more volunteers." 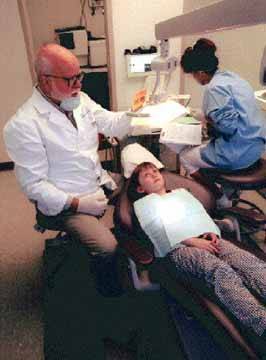 Missoula dentist and Partnership volunteer Bob Delaney came to Missoula from Chicago, where he served some low-income and Medicaid patients. "The way I used to describe it is you look in a mouth, and it looks like a hand grenade went off," he said. Missoula is not that different, he said. "The need is there," he said. "And it's not going to be addressed if we don't do something." Missoula dentist John Snively, who is Partnership's representative of the dental community on its board and a volunteer, says that what bothers him most is the problems he sees in children. They come mostly from a lack of education on the part of parents because of their lack of contact with dental professionals. "It's usually a poor diet," he said. "For the most part, if a child has three squares a day and selected snacks, they don't have much decay." With a good diet and a little dental care, children do pretty well, he said. "That's where I think a dental clinic like this shines," he said. "You can take care of kids who have a cavity or two, fill them, and send them on their way, and they're going to be OK. Those are the ones who make me feel good." "The underlying social problems, I'm not even sure Partnership can address that." That's where the clinic's volunteer hygienists come in. "We see pretty extreme disease," said volunteer hygienist Mary Lynn Eiseman, a Missoula hygienist for 18 years. "It's an opportunity to educate and clinically to improve their condition." In December, the Missoula chapter of the Montana Dental Hygienists' Association donated $600 worth of equipment to the clinic to show its support for the clinic's mission. Teresa Dougherty, a Missoula hygienist who's past president of the Missoula component, said she thinks volunteerism will pick up in the fall. "They opened the clinic in April, and then summer hit," she said. "I think that's why the numbers are so low." Decay can be totally preventable, she said, with education about brushing and flossing and the use of sealants for molars. If every hygienist in Missoula volunteered a little bit, she said, much of the waiting list would go away. "I feel that ethically I'm committed to donating my time and talent," she said. "As a dental hygienist and a Catholic and a mother, I feel I have to help these people. These people have nowhere to go." Eiseman feels much the same. "I do it primarily because I feel it's important to give back to people who've been less fortunate than I," she said. "I've had a pretty blessed life. It's basic why I do it. I have something to offer, and there's people in need. It's simple." Collins is committed to making the dental clinic self-supporting without federal money. It was built with a $40,000 Dental Pilot Program grant from the Bureau of Primary Health Care, a division of the U.S. Public Health Service. The other $30,000 came from the new-building budget raised by a capital campaign last year. The clinic gets some revenue from what patients can pay, and Collins is writing more grants. ntal clinic has been so exciting for us. Dental pain and dental issues have been such a concern in our medical clinic downstairs. I think there's a chance for Missoula to really make a name for itself."